Today we made it to the annual Memorial Day party at the Dugan's house. Hailey was so excited to get in the pool. She's such a little fishy. Thanks for watching her in the pool, Clarice! Neither of us are really big on swimming so it was nice that someone would swim with Hailey. ... just to lick off the frosting. We got to see Greg and Annie and the kids at Bri's Tangled birthday party this morning. Mom made the cake into Rapunzel's tower. Hailey liked seeing her cousins and jumping in the bounce house but she also wanted to run around the park and play on the playground. Even Rapunzel was there to sing and tell stories and paint the girls' faces. Happy Mother's Day Jeni! We hope you love your flowers. It's﻿ a good Sunday when we come home from Church and Hailey goes down for a nap. Today we went spent our last day on a tour of Tuscany. 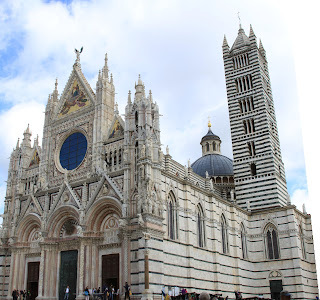 Our first stop was in Siena. The big thing in Siena is the Palio, a horse race between the 17 districts of the city. The districts are so small that we would walk into a new one just walking down a street or two. The stripes used to be green but, because the stone is porous, it has absorbed all the smoke and incense over the years turning the stripes black. The grand ceiling in the library. These 16th century frescos have never been restored but, because no candles or outside light have ever been allowed in the library, they look as vivid and perfect as the day they were painted. The walls are lined with entire books of gorgeously-illustrated manuscripts. Next we went to a local farm and vineyard for lunch. All of their cows are milked by hand every day. There was a wine tasting. We were the most coherent people when all was said and done. While everyone swirled their wine glasses we swirled our water glasses. An exceptional glass of water definitely smells better than wine. Next stop: a little medieval town called San Gimignano. Our view from the vineyard/farm. We could see all sorts of beautiful pottery. But all we really wanted was some world-famous gelato. Today was Jeni's birthday so we had gelato instead of cake. Can't pass up a photo of some cool vines climbing the walls. What a nice, relaxing day in the Tuscany countryside. Next stop: Pisa in all its glory. It's so neat to see all the different styles of the churches around Italy. It's so pretty with the white stone and all the pillars and arches. Rather than baptising inside the church this seperate baptistry was built because only the baptized could then enter the cathedral. We didn't get a chance to go inside any of the buildings; we were too busy taking all our pictures from the outside. Now that we have seen everything we came to see, we are all walked out, and have spent all our money we are ready to fly home tomorrow. It's been a great trip!